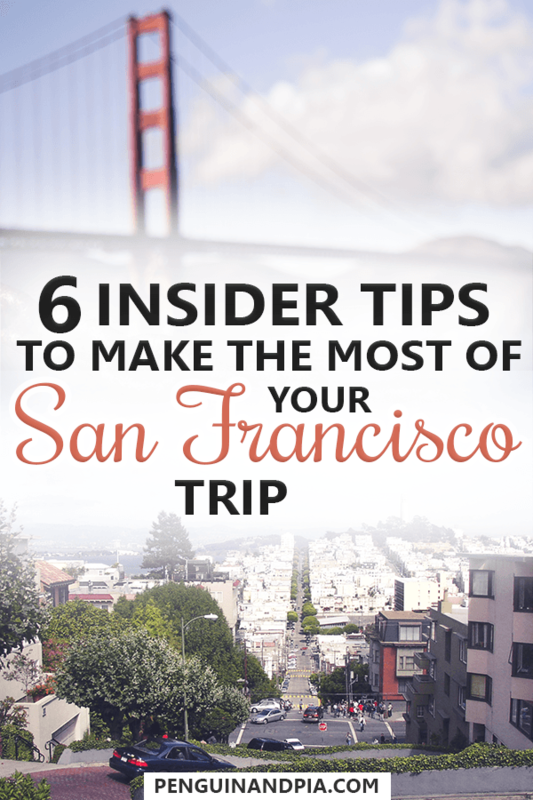 Want San Francisco Insider Tips? Our Local Guide Tells All! People are looking for insider San Francisco food tips and other things to do in San Francisco that are truly unique. Coming across tips in San Francisco isn’t too difficult – it’s finding the best ones that are the problem! With so many San Francisco travel tips out there, it can be hard to decipher which are good and which are truly generic. It’s almost like you need a local’s guide to San Francisco! When it comes to San Francisco, we’re both not the person to ask. We’ve both been there at different times in our lives (long before we met on Instagram) but it’s been so long that we don’t remember a whole lot even though we played tourist and loved the city! So, we asked our good buddy Greg to bring you his thoughts about insider travel tips for San Francisco. Eric met Greg in Prague in 2015 while travelling and they’ve been connected ever since! 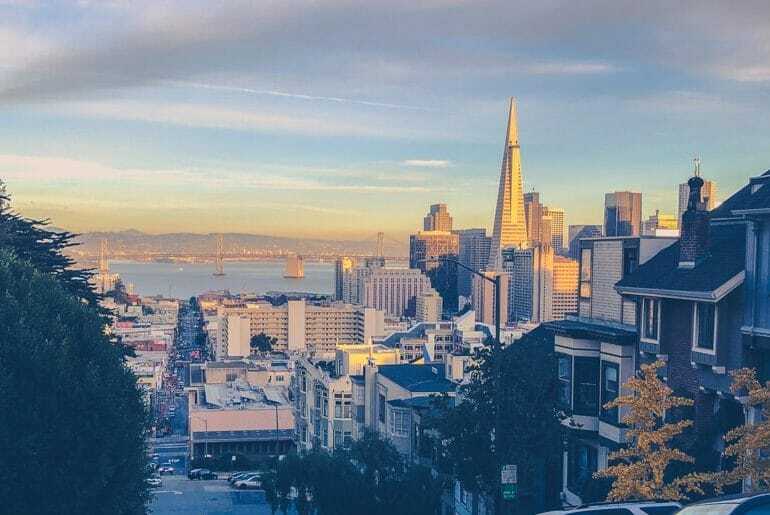 As a Bay Area Native, Greg knows a thing or two about the city and is a fantastic resource for your next trip. He brings you his San Francisco local favourites from awesome views to cafes and hikes! So, take it away, Greg! 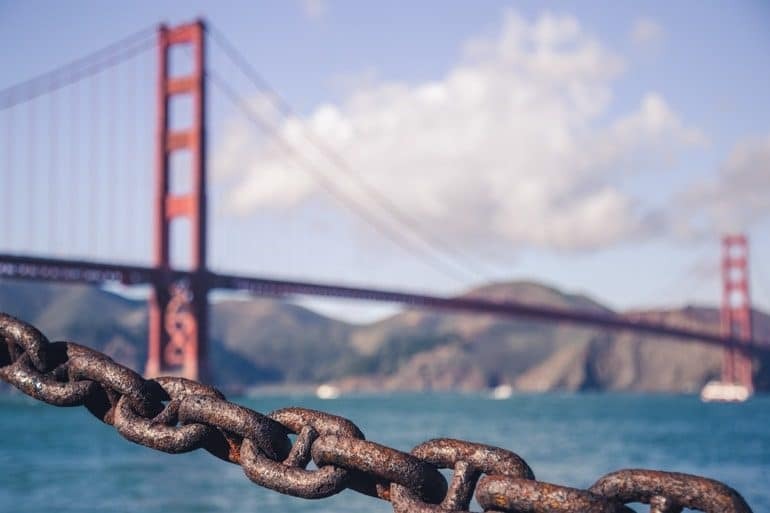 If you plan on visiting multiple paid attractions, a San Francisco Pass can be a good option to save some money. 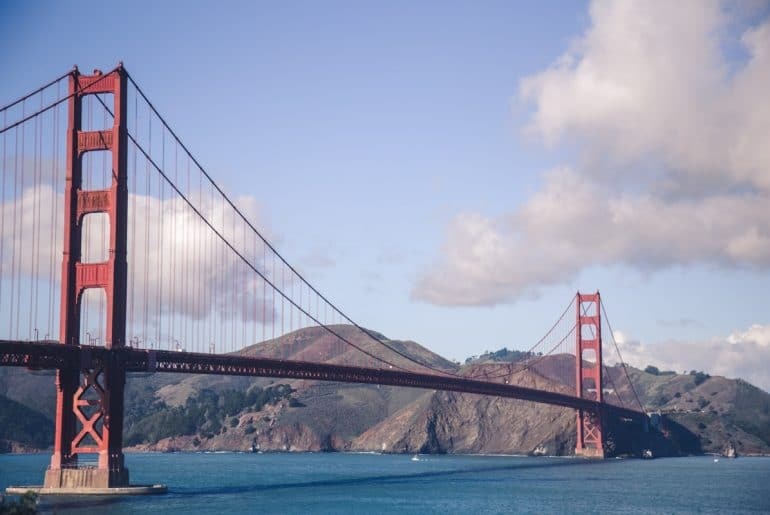 Whether you decide to stay for one day or for two weeks, San Francisco will keep you busy! This metropolitan area is packed full of things to do, different cultures and experiences that create the charm that we have come to know and love today. The beauty of a city like San Francisco is that there is always something new to experience or do! So don’t let this stifle you from trying new things, but guide you to creating your own experiences. Lombard Street causing quite the curve in the daily commute… // Photo: Greg D.
Exploring will always have its challenges, like avoiding tourist traps but still feeling like you got to see the landmarks that often define a city like this. Below you will find my top 5 favorite things to do in San Francisco. This list is ever-changing and will give you a glimpse into the many things this city has to offer! Looking for a Hotel in San Francisco? Check here for Deals in the City! The one, the only: The Golden Gate Bridge. // Photo: Greg D.
By far one of the most iconic bridges in California, and maybe even the US, the Golden Gate Bridge is worth a visit! Originally opened to the public in 1937, this bridge spans 4,200 ft and stands 746 ft tall. Make sure you’re wearing comfortable shoes or hop on a bike, crossing there and back will clock in at about 1.5 miles. If you’re feeling really good, take the path along the bay before crossing the bridge. It is called the San Francisco Bay Trail, and it is beautiful. A few years back I ran a race called the Bridge to Bridge that takes place mostly on this trail. I credit the views to getting me through that race without any training. This trail runs for 500 miles and covers 9 Bay Area counties and 47 cities. You can hop on to the trail wherever you would like, I would suggest a bike or skateboard to help cover more ground in a timely matter. Views of the Bridge from the Trail. // Photo: Greg D.
The bridge is fun to cross whether it is a clear day or the top of the bridge has disappeared into Karl the Fog. Yes, the fog in San Francisco is named Karl. Check out Karl the Fog’s Twitter Account if you don’t believe me! Some say this is a reference to Tim Burton’s movie “Big Fish”. Either way, it makes for a fun experience. 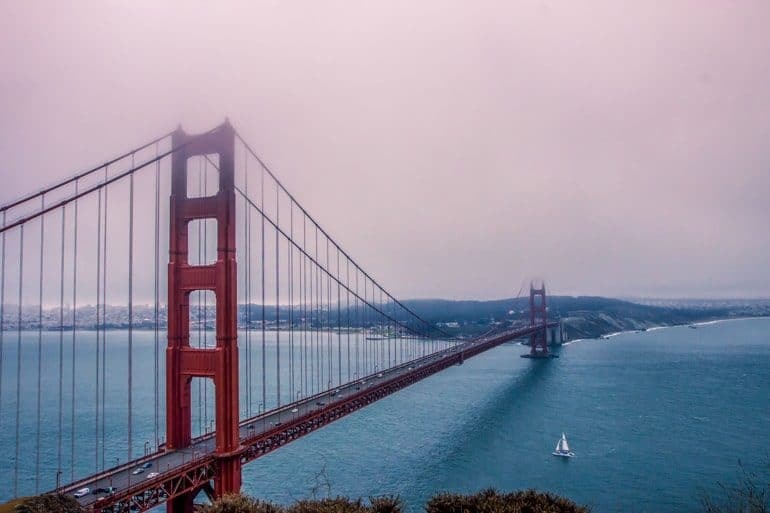 Crossing over from San Francisco to the Marin Headlands will lead you to one of my favorite views of the bridge, and my next favorite thing to do in the city. Read below for more! Exploring the USA? – Tips for Miami, Washington D.C. Attractions, and Boston Sights Await! The Golden Gate Bridge from the Battery – with “Karl” the Fog rolling in. // Photo: Greg D.
This retired military battery was originally built in 1897 and is named after Major General Joseph Spencer. At one point in time, it housed three m1888 guns that were used to protect the Bay. To get there coming from San Francisco, take exit 442 Alexander Avenue and turn left followed by a right turn onto Conzelman Road where you will find limited parking. Exploring the Battery is cool, but I usually skip it and walk right to the cliffside where you get an amazing view of the Golden Gate Bridge and Alcatraz depending on the weather. Either way, it makes for a great experience. Depending on whether you go for sunrise, sunset, or somewhere in between, grab some beers or coffees and enjoy the views. I personally love going for sunset and watching the lights come to life while sipping on some beers with good friends. A blanket or small chairs are never a bad idea to bring if you plan on staying for a bit. Coit Tower sitting proudly atop Telegraph Hill. // Photo: Greg D.
Through the traveling I have done, vantage points of the city are often my favorite and most memorable experiences. They are often free and are a good time to step back and look at the city from an outside perspective. 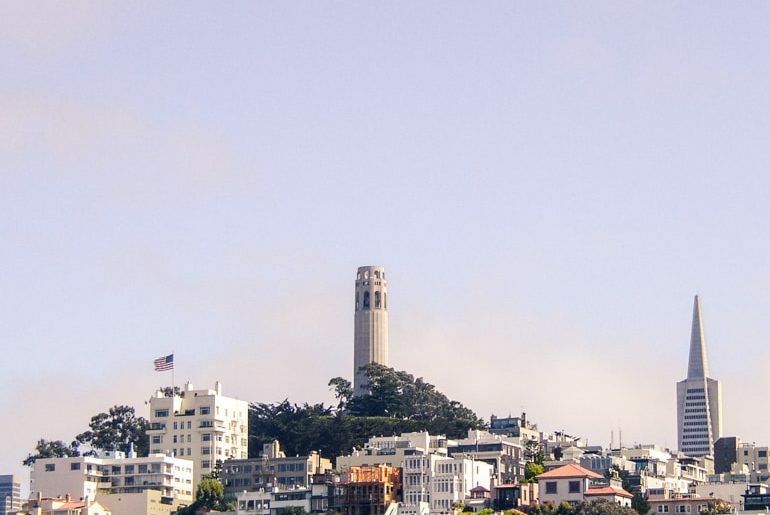 I have two favorite views of San Francisco with the first being Coit Tower. Coit Tower was first built in 1933 and is also known as Coit Memorial Tower, in remembrance of the firefighters who died during some of San Francisco’s most prolific fires. It was built using the money left behind by Lillie Hitchcock Coit who admired firefighters greatly. 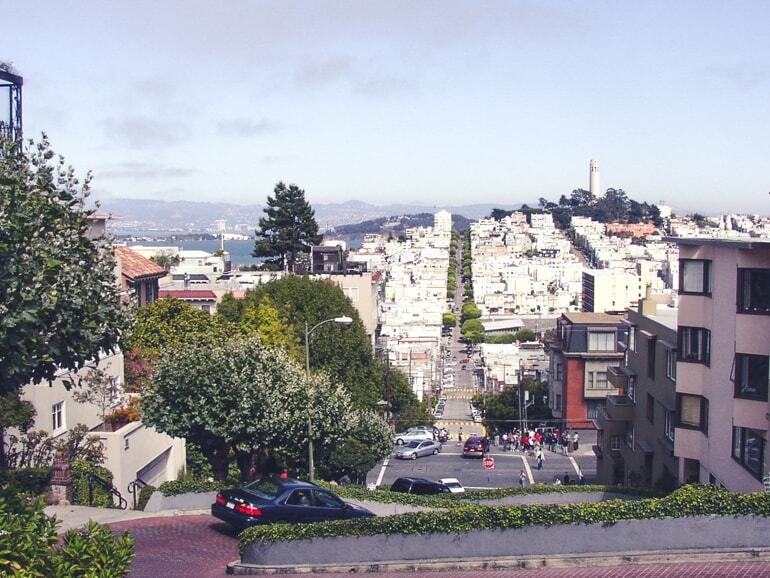 Located on Telegraph Hill, you’ll get the best 360-degree view of the city. Parking can become a bit crowded depending on what time you go up, but it is definitely worth a visit anytime of the day. The infamous island of Alcatraz off in the Bay. // Photo: Greg D.
The other view I love is from Russian Hill, which gets its name from Russian sailors who are buried up there. Amidst the few commercial buildings and many residential are some great views of Alcatraz and the Financial District. My favorite spot is at the intersection of Vallejo and Jones street. 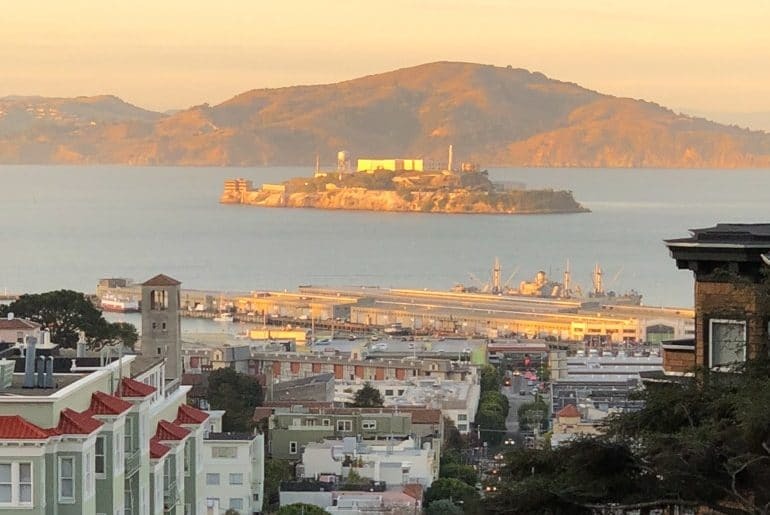 It is at the top of some of the steepest hills you can climb in the city, so either prepare to walk up or take the Powell-Hyde cable car up the steep parts and walk over. That “golden glow hour” over the Financial District. // Photo: Greg D.
Sunset is my favorite time to catch the golden light in the city. Walk over to Allegro Romano, a little neighborhood Italian restaurant located on the corner of Jones and Broadway street after you’ve checked out the views. Of the many districts in San Francisco, the Mission is definitely my favorite. Over the years this district has grown immensely in popularity and for good reason. Originally home to working-class Latin American families, this culture packed district is full of good bars, great restaurants, and what many would say is the origin story behind burrito culture in California today. What many would call grungy, I would call character and the Mission is not lacking in either. Cruise over to Ritual, Sightglass, or Four Barrel Coffee to get caffeinated for your full day ahead. The Mission certainly isn’t lacking in its variety of great coffee, I often grab a few lattes throughout the day! Dolores Park can be a great hang out during those rarer sunny San Francisco days. Grab some drinks with friends, or cruise over and meet some new friends there. Dolores Park has turned into quite the hotspot on the weekends, so if you’re looking for a good time this is the place for you! Whether you’re in the mood for Italian, Chinese or one of the countless Taquerias, there is something for everyone. For Italian, definitely check out Flour and Water! It is located on Harrison Street, right in the center of the Mission. If you’re looking for Neopolitan style pizza, good pasta, or traditional Italian faire, this is the place for you! For an interesting take on Chinese, check out Mission Chinese. Many describe this place as hipster, but I prefer unique. Serving up your not-so-run-of-the-mill Chinese food that is completely new yet oddly familiar. When it comes to good Mexican food, the choices are endless and you can’t go wrong stumbling into whichever taqueria you find first. My favorite is La Taqueria, which many crown as the best mission style burrito in San Francisco. This place is cash only, so come prepared. Dragon Gate welcoming you to Chinatown. // Photo: Greg D.
One of the more iconic spots in San Francisco, Chinatown, is packed full of crowded shops, cool markets, and home to many generations of immigrants who helped to make the city what it is today. Chinatown is one of the lowest income areas in San Francisco, populated by Chinese immigrants old and new alike. 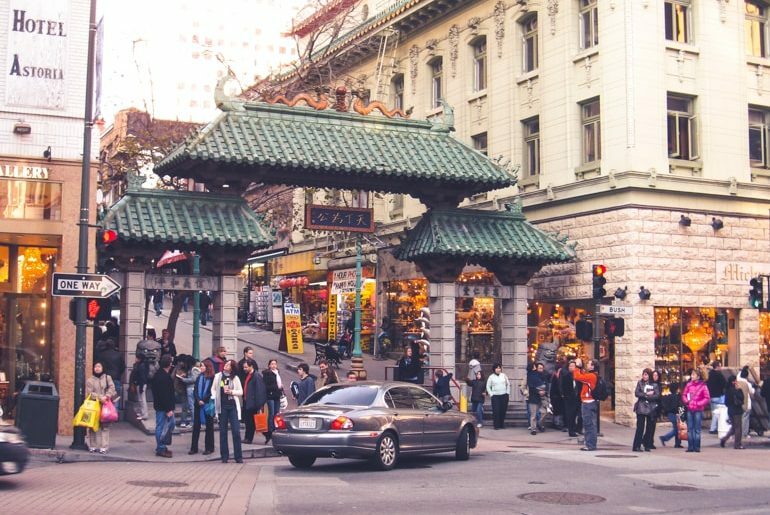 Whether you want to wander the streets or people watch, Chinatown is for you. Check out the groups of people playing Chinese Chess at Portsmouth square or wander into many of the small shops selling everything from small trinkets to fish varietals you’ve never seen before. This densely populated area is full of unique experiences to be had by all. If you’re looking for good Dim Sum, you’re in the right place. Check out either Good Mong Kok Bakery or China Live for some authentic Dim Sum that won’t break the bank. Tea houses are also a popular destination in Chinatown. These places are a fun way to get a glimpse into Chinese culture. This area is full of them and you can’t go wrong wandering into one. Be sure to check out the iconic Dragon Gate, which is at the intersection of Grant and Bush street. Grant is one of the oldest streets in San Francisco and runs nearly the entire length of the city. Many argue whether or not it actually is the oldest street, but it is certainly up there. This is a fun one that is worth checking out if you are into Yoga or just looking for a spiritual experience. The Grace Cathedral, which should be checked out on its own anyways, hosts yoga on Tuesdays. Their aim, as they claim, is to attempt to meet people spiritually wherever they are. This is open to people of all ages and beliefs. Meditating amidst the beautiful labyrinth floor and high vaulted ceilings above is truly a “graceful” experience. The event is free but they suggest a $10 donation. And there you have it, five things, a bunch of recommendations for San Francisco food, and a bonus tip to help you discover the city like a pro! What do you think? Let us know if you’ve been to any of these or try any of them – we’d love to hear about your experience. 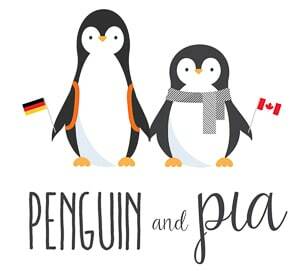 A huge thank you to Greg for sharing his knowledge – he’s a true ally to Penguin and Pia! You can follow his adventures around the world @greg_always. The only problem with doing this post is now we REALLY want to visit the city… but we live in Europe. Hmm, how much are flights again?